Sadly, the hierarchy Ido mentions is rarely followed today. We identify with the sport we participate in – for most of us we’re rowers first and foremost. Being the best at a singular sport has become the priority over athletic development and movement competency. There is tremendous value for all athletes in being a generalist rather than a specialist. Integrating primitive movement patterns into training, outside of the formal training for our sport, will lead to improvement in the sport! We are humans and movers first – we need to squat, bend, push, pull, twist, hinge, lunge, and crawl. A startling fact from Stop Sports Injuries shows the price of being a specialist: “Overuse injuries are responsible for nearly half of all sports injuries to middle and high school students” (1). To reach the next tier of athletic achievement we need to look to our past. The Greek city-states of Athens and Sparta were the first to formalize a physical education system. The Greek physical education system had three types of trainers to develop an athletes’ mind and body: Paidotribes, Gymnastes, and Aleiptes. Paidotribes were physical trainers for competition such as wrestling, Gymnastes were considered the sports scientist of their day – they possessed theoretical knowledge about the best training methods and nutrition. The Aleiptes performed massages on athletes (2, 3). The focus for most trainers in present day society is to work out an individual. There is less emphasis placed on movement quality, skill acquisition, and development of spatial awareness. The focus is on more reps, heavier weights, and burning calories. Training should be a total mind-body experience and carried out as a practice – one we continue to work at for our entire lives. We must be present and engaged in our practice. This mindset is what propels athletes’ to better performance and will seamlessly carry over into their lives as well. The three areas of human movement – restorative, martial, and pedagogical – should really be thought of as the three disciplines of training. Most rowers will not be fighting and it is unnecessary for them to learn the martial component to training. However, they will benefit tremendously by integrating restorative modalities into their training such as Indian Club Swinging. 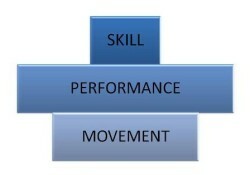 This will rebalance their training and move the individual closer to achieving the Optimum Performance Pyramid. This is the approach I take with my clients and athletes. Leave your questions or comments below. Next week I will have my first video blog post. Stay tuned! 1. Youth Sports Injuries Statistics. StopSportsInjuries.org. Website. 2. The Ancient Olympics. Ablemedia.com. Website. 4. Gill, Brian; Jones, Brett; Cook, Gray; Thomas, Dr. Ed. Restorative Exercise with Indian Clubs Manual. 2014. Print. 5. Leonard, Fred E., and Robert T. McKenzie. A Guide to the History of Physical Education. Philadelphia: Lea & Febiger, 1927. Print. 6. Cook, Gray. Movement: Functional Movement Systems: Screening, Assessment, and Corrective Strategies. Aptos, CA: On Target Publications, 2010. Print.